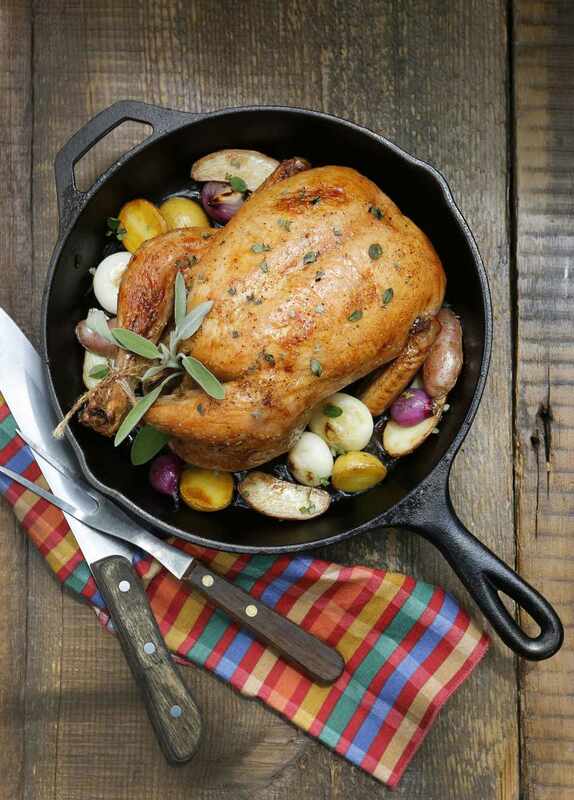 This delicious roast chicken gets it's flavor from a complementary mixture of bacon and sage, along with a little garlic. Try putting an apple or other fruit in the cavity before roasting. Optional: sprigs of thyme, sage leaves, rosemary leaves, etc. Heat oven to 450 F. Wash chicken and pat dry. Set the chicken on a rack in a roasting pan. If you don't have a rack, set the chicken on a few ribs of celery. In a food processor or chopper, process the bacon, sage or thyme, pepper, and garlic until finely minced or pasty in consistency. Put your finger(s) between the skin and meat of the chicken breasts and legs, loosening skin. Spread the minced bacon mixture under the skin, pressing and working it towards the back and towards the legs so it is evenly over the meat. Put any excess minced bacon mixture in the cavity of the chicken, along with apple or orange chunks and sprigs or leaves of fresh herbs, if desired. Sprinkle the chicken lightly with salt and pepper. Roast the chicken for 10 minutes at 450 F. Reduce heat to 350 F and roast for about 17 to 20 minutes per pound, or until an instant-read thermometer reads about 165 to 170 F when inserted into the thickest part of the thigh. Remove to a platter and let stand for 10 minutes before carving.